Is the next "Massachusetts Miracle" upon us? The state has to borrow an additional $600 million this month to address a short-term cash-flow shortage and meet end-of-the-year local aid payments to cities and towns, prompting warnings from the Romney administration and the state treasurer that the Commonwealth is spending at a perilous pace. Treasurer Timothy P. Cahill and Thomas H. Trimarco, the secretary of administration and finance, sent a joint letter to lawmakers late yesterday outlining a plan to borrow the $600 million, which would be in addition to $300 million the state borrowed last month for the same purpose. Yesterday, Romney's communications director, Eric Fehrnstrom, said short-term borrowing is a step the state takes annually, but that the high amount the Commonwealth is borrowing this year "underscores the wisdom" of Romney's spending reductions last month. Michael Widmer of the Massachusetts Taxpayers Foundation, one of the state's leading fiscal watchdogs, said he thinks the amount of borrowing should result in a "cautionary note" but is no cause for alarm. "It's certainly a yellow flag, and it reflects the fact that the spending increases in [fiscal year] 2007 were ... larger than they should have been," he said. "But at the same time, tax revenues are likely to cover the spending increases in 2007 when the year ends." Two documents released this week ought to temper the urge towards irrational exuberance exhibited by those looking forward to the new era of Democratic hegemony on Beacon Hill. The governor-elect, Deval Patrick, continues to keep his own counsel regarding the budget. But some of those who were in his camp, along with certain members of the Legislature, seem poised to embark on a spending spree the likes of which has not been seen since William Weld took office in 1991. It appears that in the wake of Patrick's victory, talk of an income-tax rollback has gone by the wayside. But we don't sense any appetite for a tax increase. On the other hand, there are those clamoring for the state to spend more on everything from local aid to park maintenance. Over-exuberant spending on Beacon Hill hasn’t yet put Massachusetts on the brink of fiscal disaster, but the extraordinary level of borrowing this year to keep the government afloat should be a wake-up call. Moderate economic growth in recent years has resulted in billions of dollars in revenue surpluses, but the unanticipated collections largely have evaporated in a series of "supplementary spending" sprees. 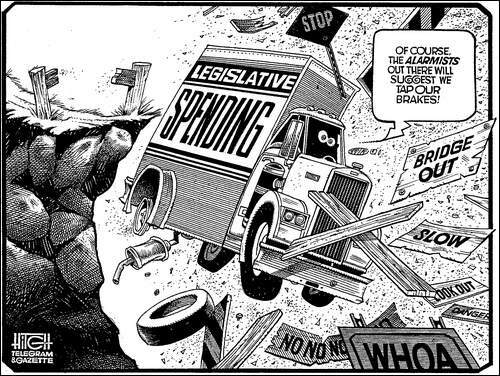 The budgetary brinksmanship continued this fiscal year. Lawmakers balanced the budget, but only by reneging on the income tax rollback and drawing deeply on "rainy-day" funds — while overriding Gov. Mitt Romney’s efforts to rein in spending. Voters in Massachusetts cities and towns have rejected two-thirds of proposed property tax overrides this year, reflecting widespread distaste for higher property taxes, according to a Globe review of state property tax records. A town official in Newbury -- where a number of overrides have been struck down in recent years, including two this year -- said tax increases are a tough sell, politically. But, as a further sign that taxpayers are squeamish about raising taxes, debt exclusions also failed far more frequently this year. Less than half of the 219 debt exclusions on the ballot this year were approved, while 85 percent were approved in 2001, according to the Globe analysis. The average override attempt this year was $630,160, highest in three years, according to the Globe analysis. My first reaction to Gov.-elect Deval Patrick’s plan to use his grassroots organization to influence debate on Beacon Hill is akin to my reaction when I come across a particularly explicit medical documentary on TV -- equal parts revulsion and fascination. The idea of all those drivers with the "Together, we can" bumper stickers still on their cars using their hands-free cellphones to call the State House operator should be enough to make every taxpayer left off Patrick’s e-mail list queasy. For one thing, the Democratic convention delegates, caucus-goers, union local leaders, town meeting goers and coat-holders of mayors and selectman aren’t really "grassroots," or the voice of the people, in the way, say, the 170,000 voters who want a vote on gay marriage or majority of voters who supported the income tax rollback are grassroots. Call me a cynic but I have goose bumps, too, for a far different reason. The incoming administration which said "grassroots is not just a strategy for winning but a strategy for governing" is in danger of using the grassroots as a strategy for manipulating. At first glance, state plans seem to be nearly as healthy as their corporate counterparts: they face a shortfall of $348 billion under current accounting rules, according to the National Association of State Retirement Administrators. This implies they are 86 percent funded, versus 90 percent for corporate plans. States must be honest about their pension liabilities and the true value of plan underfunding. The board today signed off on an expansion of employee family and medical leave benefits that fund officials said would bring those benefits on par with benefits received by most state employees. Aw geez, here we go again, already -- and the incoming Democrat governor hasn't even been sworn it yet. The state -- the Legislature -- is already intent on borrowing almost another billion taxpayers' bucks, just to get through this fiscal year after its revenue surplus feeding frenzy. "It's certainly a yellow flag, and it reflects the fact that the spending increases in [fiscal year] 2007 were ... larger than they should have been," said Michael Widmer, president of the so-called Massachusetts Taxpayers Foundation, before again providing cover for more increased spending -- and borrowing. "But at the same time, tax revenues are likely to cover the spending increases in 2007 when the year ends," he concluded, optimistically. But Widmer and MTF have always opposed our tax rollback -- because the state can't possibly afford the revenue loss. Hey, borrow away Beacon Hill -- Widmer and MTF, "one of the state's leading fiscal watchdogs," just gave you the green light, as usual. Just make sure that the $12 million taxpayer dollars in interest payments makes it into the bankers' coffers. I wonder why nobody mentioned that MTF's fat-cat members include major banking corporations across the state? C'mon Michael, tell us when state borrowing is too much -- is there such a limit at MTF? Who could possibly imagine? "Voters in Massachusetts cities and towns have rejected two-thirds of proposed property tax overrides this year, reflecting widespread distaste for higher property taxes." Perhaps they've reached their taxation saturation point -- when they can't feed and house themselves, their families, and continue paying for government spending sprees at all levels? The nice thing about Proposition 2½ tax increases is, taxpayers can say no to them. "Critics, however, say that local officials became overly accustomed to the economic prosperity of the 1990s and expanded services too rapidly and signed off on overly generous collective bargaining agreements during the boom...." Uh huh, gee whiz what a surprise! [See: "Embarrassment of Riches" from 1999] It's not like overspending snuck up on municipal "leaders," or even that they learned anything from past profligacy since their state taxpayer-funded gravy train slowed down. Is there any wonder why voters have said no in record numbers lately? And there it is again, another "ticking time bomb" warning about public sector pensions. But nobody receiving a public pension gives a whit -- it's just "Gimme more, more, more; I'm special, and protected!" "States must be honest about their pension liabilities and the true value of plan underfunding," wrote Thomas J. Healey, currently a senior fellow at Harvard University's Kennedy School of Government, with many other credentials as an economist within government. Meanwhile, here in Taxachusetts (and please, nobody tell me again that this term is obsolete), the Senate President's brother, Michael Travaglini -- as executive director of the state pension fund, one of the two highest-paid state employees in Massachusetts ($322,000/year) -- "signed off on an expansion of employee family and medical leave benefits that fund officials said would bring those benefits on par with benefits received by most state employees." "On par"? Lucky them. Your less fortunate grandchildren will be paying for that and much more by then at this rate -- but they can't vote yet. The $900 million total the state is borrowing to cover its current obligations is the highest such amount in at least six years and will cost taxpayers $12 million in borrowing costs. The reason for the borrowing is that the state has bills due now, but won't receive much of its revenue until the first six months of 2007. Still, state officials expect to pay off the debt as tax payments come in over the next several months, and they anticipate ending the fiscal year on June 30 with a balanced budget. But that assumes that 2007 revenues will meet or exceed expectations, Cahill said, and the unusually high amount of borrowing this year should send a message to the Legislature and Governor-elect Deval L. Patrick that they need to be cautious in approving new spending. "I want to prepare the incoming administration and the Legislature for what could be some tough times," Cahill said in an interview yesterday. "They need to know the truth, and the truth is we have a cash-flow crunch, maybe not a crisis, but certainly a cash-flow shortage. It's not good for a household, and it's not good for government." News of the borrowing follows Governor Mitt Romney's decision last month to cut about $425 million in spending, which he cast as a corrective measure made necessary by overspending by the largely Democratic Legislature. Romney restored $42 million of the cuts last week after tax revenues for November came in well above expectations. The cuts Romney made to the budget last month affect the overall amount the state will spend this fiscal year. The amount of borrowing outlined yesterday pertains only to a short-term gap between expenditures and revenues and does not change the bottom line, beyond the $12 million in borrowing costs. "There is a now-typical pattern of tightening in the Commonwealth's cash position in the second and third quarters of the fiscal year, but this year it has been exacerbated by the fact that the Legislature is spending at a high rate," Fehrnstrom said. The strain on the state budget usually occurs at this point in the year. Last fiscal year, according to figures provided by Fehrnstrom, the state borrowed $200 million at this point in the year. In fiscal year 2005, the state borrowed $700 million, and in fiscal year 2004 it borrowed $450 million. In fiscal years 2003 and 2002, the state borrowed $700 million and $800 million, respectively. A spokesman for House Ways and Means chairman Robert A. DeLeo said yesterday that the borrowing was standard operating procedure and does not portend anything ominous. "In order to make the payments, we do some short-term borrowing, but it all evens out in the end," said the spokesman, James Eisenberg. "In short, the fact that we are doing cash-flow management borrowing is not an indicator of a cash-flow problem." A spokeswoman for the Senate Ways and Means chairwoman, Therese Murray, declined to comment. Cyndi Roy, a spokeswoman for Patrick's transition team, said: "We would appreciate the treasurer's counsel, but we reserve any comment until we see a letter and have further discussions about the budget." Cahill, a Democrat, supported Patrick in the gubernatorial campaign. In their letter to DeLeo and Murray, Cahill and Trimarco cite as a reason for the borrowing $935 million in spending that the Legislature authorized in the prior fiscal year but that was carried forward to this fiscal year and is projected to be spent by June. The cash shortage, according to Cahill and Trimarco, also stems in part from a transfer last month of $354 million to the stabilization fund and more than $100 million in payments the state has to make on the Big Dig until the US government releases more federal funds. At the same time, the state owes cities and towns another $1.2 billion in quarterly local aid payments by the end of the month. "It seems to be that we're spending more money than we're bringing in," Cahill said in the interview. Cahill pointed out that during the state's last recession, in 2001, the state saw a large drop-off in capital gains revenue after the stock market suffered major losses. While he doesn't expect that to happen again, a significant reduction in real estate values could produce a similar result, he said, and it is important to be cautious about spending. Patrick is already under pressure from the Massachusetts Municipal Association, which represents cities and towns, to commit to providing more local aid. The state boosted local aid about 9 percent overall this year, said Geoffrey Beckwith, the group's executive director, but communities are still receiving 13 percent, or about $680 million, less than they received in 2001-2002, after inflation is taken into account. Cahill said he believes it's important for state officials to tread carefully. "I don't want to sound like an alarmist, but at the same time I don't want to paper over it," Cahill said. "I'm here as the state's chief financial officer to make sure that both the Legislature and incoming administration understand that we're not out of the woods yet." But Monday the outgoing Republican administration and Democratic State Treasurer Timothy Cahill warned in an unusual joint letter to lawmakers that the amount of short-term borrowing required in order for the state to meet its obligations so far this year is reason for concern. In contrast to the $200 million the state had borrowed to this point in 2005, it's already had to go to the short-term market for $900 million in order to pay its bills through December. Healthy tax revenues are a function of a robust economy, and on that score the Associated Industries of Massachusetts had some sobering news in a report also issued Monday. Its Business Confidence Index was down four-tenths of a point from the previous month -- not terribly ominous, but disappointing after having gone up significantly in three of the previous five months. More encouraging was some of the narrative accompanying the latest A.I.M. report in which members of its board of economists predicted a fairly smooth ride for the regional and national economy over the next six months. "Survey respondents expected Massachusetts conditions to improve slightly in the six months ahead," noted John Bitner, chief economist for Eastern Bank. Richard Lord, A.I.M. 's president and CEO, said the outcome of last month's election appeared to have had little impact on business confidence, adding, "The Index's performance over the past two months suggests that the state's employer community is not alarmed by the prospect of a Democratic governor and one-party government. In his campaign, Governor-elect Patrick accurately identified the key economic issues facing the commonwealth and pledged to address them cooperatively -- a challenge that is now before him." It appears that in the wake of Patrick's victory, talk of an income-tax rollback has gone by the wayside. But we don't sense any appetite for a tax increase. On the other hand, there are those clamoring for the state to spend more on everything from local aid to park maintenance. And certainly the new governor will face some difficult decisions come January such as whether to restore the $380 million worth of spending cuts imposed the Romney administration last month. With the state's economy still in a precarious state, this is a difficult balancing act on which Patrick is about to embark. While short-term loans in anticipation of tax collections are not unusual, the amount of borrowing this year is the biggest this decade. In a letter to the Legislature on Monday, Treasurer Timothy P. Cahill and Thomas H. Trimarco, secretary of administration and finance, outlined a plan to borrow $600 million — in addition to the $300 million the state had to borrow last month. Mr. Cahill told the Boston Globe the joint letter was intended to prepare lawmakers and the new administration for a period of belt-tightening. "They need to know the truth, and the truth is we have a cash-flow crunch," he said. "That's not good for a household and it’s not good for government." Fiscal prudence should always be the watchword. The fact that the full budgetary impact of the state’s new health insurance law is yet unknown makes restraint especially important now. Moreover, there will be little progress on Gov.-elect Deval L. Patrick’s ambitious agenda — such as the aid boost he envisions to reduce local property tax bills — if his administration arrives on Beacon Hill only to find the state coffers have been drained. The rejections marked the first time this decade that more proposed Proposition 2½ overrides failed than passed. In previous years, the votes had been far more successful, with residents agreeing to increase their property taxes in order to avoid cutting positions for teachers, police officers, and firefighters or to pay for renovating municipal-owned buildings. This year, one-third of the Proposition 2½ overrides passed. Approximately 59 override votes have been rejected, while 30 have been approved, the lowest rate since at least 1999. In 2005, 94 proposals passed, and 79 failed. In 2001, two-thirds of the proposed overrides were approved. Some muncipalities put more than one question before voters. "In times of fiscal distress, where communities are making cuts and increasing their reliance on property tax, you do hit a point of voter fatigue, where the voter passage rates start to decline," said Geoffrey Beckwith, executive director of the Massachusetts Municipal Association. Twice -- once in May and later in September -- voters in Granby, in Western Massachusetts, were asked to provide $19,390 to pay for a town dog officer. Both times they rejected it. In Northfield, a rural community in central Massachusetts, a request for $3,540 for emergency medical technician salaries failed by five votes. And in Lexington, an affluent community with a prized school system that rarely votes against overrides, two overrides worth $3.2 million that would have gone toward education failed this year. As a result, 31 teaching positions were cut, along with several other programs. "This is a community that's had it up to its eyeballs with residential property taxes," said Jed Snyder, chairman of the "No -- The Best For Lexington 2006" committee in Lexington. "When you've had these huge increases in recent years, something has to give." A town official in Newbury -- where a number of overrides have been struck down in recent years, including two this year -- said tax increases are a tough sell, politically. "I've been approached on the street by citizens saying, 'How many times do we have to tell you no? Stop asking us to raise our taxes,'" said Vincent J. Russo, chairman of the Board of Selectmen. "We are at the end of our ropes here as far as overrides." Governor-elect Deval L. Patrick made the state's tax situation one of his campaign themes, arguing that a cut in the state income tax proposed by Republicans would increase pressure on cities and towns to increase property taxes. His running mate, Timothy P. Murray, also argued that because he was the mayor of Worcester, he would be a better advocate for cash-strapped municipalities. Patrick has said that he would look to reap savings for communities by taking a more regional approach to municipal services. Property tax specialists say cities and towns are still recovering from the state's fiscal crisis four years ago, when the annual money that the state provides to municipalities was cut, causing them to become more reliant on property taxes. The state has since increased aid, but not enough to offset the years of cutbacks. Critics, however, say that local officials became overly accustomed to the economic prosperity of the 1990s and expanded services too rapidly and signed off on overly generous collective bargaining agreements during the boom. Property taxes, which vary widely and range from about $1,000 to $13,000, go toward paying for all types of municipal services, from teacher salaries to trash pickup. The state's Proposition 2½ law, which was approved by voters in 1980, restricts cities and towns from raising the overall tax levy by more than 2 percent in one year unless voters approve a local override. Municipalities have also used the Community Preservation Act, another way to put a surcharge on tax bills and use the money for certain local projects. Voters can also consider another type of override called a debt exclusion, which usually goes to a specific project, such as a new school or renovations of town hall, and does not permanently affect the tax levy. "We've seen a broad decline in local services across the Commonwealth over the last several years, first with cuts to local aid and then voters' reluctance to approve overrides," said Michael J. Widmer, president of the Massachusetts Taxpayers Foundation. In Dover, voters approved a $900,000 Proposition 2½ override last year. But this year, a request for $800,000 failed by 67 votes, which meant putting off the purchase of a new fire engine and dipping into reserve accounts to balance the budget. Still, in several communities, mostly more affluent ones, voters continue to approve overrides. Wellesley approved a $3.1 million override in May after approving a $2.6 million override last year. Two smaller override requests failed this year. The average override attempt this year was $630,160, highest in three years, according to the Globe analysis. The Globe examined figures submitted to the Department of Revenue. Cities and towns are not required to provide the data. The Patrick enthusiasts are activists. And they are just as likely to influence policy debates for their own purposes as any well-heeled lobbying group such as the trial lawyers or teachers’ unions. Under Patrick’s strategy, the silent majority will still be silent. And since the pulse of this unorganized bloc of voters really only gets taken in the voting booth on Election Day, the Globe story over the weekend pointing out that Proposition 2½ overrides are being rejected in ever-increasing numbers is a much better indicator for lawmakers of the vox populi on the tax issue, just to pick one, than artificial pressure generated by the Patrick machine. This doesn’t diminish that Patrick won the election by a huge margin. But polls showed that even most voters supporting him disagreed with his stances on taxes and illegal immigration, for example. Thus, neither the media nor an inundated legislator should mistake a cascade of calls, e-mails or postcards generated by Patrick maestro John Walsh as any more representative of public opinion than a badly constructed poll which oversamples one segment of voters. Similarly, the Patrick camp is relying on the perception that its transition process is all about the "power of the people" rather than insiders to shape a sense of mission or mandate for the new administration. In a conference call with reporters yesterday Walsh and Patrick transition committee co-chair Gloria Larson touted the "most inclusive process in modern times" in describing some 43 community meetings around the state designed not only to "welcome input, but solicit it." But they overstate their success when hyping the turnout of 100 people in Worcester or 200 in Boston as indicative that "people are hungry" to participate. It is surely not the Patrick team’s fault that most voters are too busy getting flu shots or getting a jump on their Christmas shopping to show up and give their 2 cents’ worth on the "creative economy." But neither should they pretend that their efforts, thus far, have been some kind of breakthrough in civic engagement. To his credit, Walsh acknowledged that even though he defines "grassroots" as going "where people are," the Patrick team is still trying to understand other ways to broaden involvement. He asked for suggestions, so here’s one: Link Patrick’s grassroots website to other sites which are not a natural part of the Patrick base, whether that be taxpayers advocates, free market think tanks, business groups or conservative bloggers. Prominently post their feedback on various Patrick initiatives. Invite their participation in community meetings or State House hearings. Show there’s substance to the statement: "We love the critics." When asked whether the assembly of an Internet-based grassroots network was really, essentially, a propaganda tool, Walsh said, "Communication is a two-way street." And "what people really want is to be heard." Larson went so far as to say the enthusiasm she senses for participating in the Patrick transition gives her goose bumps. President Bush recently signed into law the Pension Protective Act of 2006 in an effort to strengthen the financial health of corporate defined benefit pension plans. However, little attention is paid to a retirement sector in even greater financial straits: state government pension plans. These plans are facing a $1.3 trillion shortfall that presents a serious threat to their very survival -- as well as to every taxpayer in the country. State pension programs -- which cover 12.8 million Americans and manage assets worth $2.3 trillion -- are a pillar of the nation's retirement system. By comparison, corporate defined benefit pension plans cover 44.1 million participants but possess fewer assets -- about $1.7 trillion. However, these projections are misleading. The real shortfall of state-defined benefit pension programs is closer to $1.3 trillion, which translates into the plans being 64 percent funded. This alarming gap could set off a crisis whose magnitude would dwarf the $200 billion government bailout of the savings and loan industry in the 1980s. Just as disturbing, this threat is largely ignored because of opaque accounting. Opaque accounting dramatically distorts the liability side of the pension ledger. The key question is whether pension plan liabilities are being properly measured. The liabilities of defined benefit pension plans are measured by using a discount -- or interest -- rate. Unlike corporate plans, which must use high-quality corporate bond rates as their discount rate, state pension plans are allowed to use the much higher expected return on the assets they manage, artificially shrinking their liabilities. This practice perniciously disguises the actual health of state-funded pension programs. As with corporate plans, state plans should be discounted using long-term corporate bond rates instead of the expected rate of return on assets, which is the current practice of most state governments. Consider how distorting this practice is. Specifically, the average expected return on assets across state pension plans today is about 7.89 percent, according to the NASRA. Based on this return, their liabilities are estimated at $2.5 trillion. If, however, the plans use as their discount rate the more credible 10-year Treasury rate, at about 4.9 percent, their liabilities would weigh in at $3.5 trillion -- a whopping 42 percent increase. Startling as this finding is, it simply stems from applying to state-defined benefit pension plans the same accounting principles that corporate plans must live by. In New York City, the chief actuary recently released supplemental financial projections that show that instead of its public pension plan being 100 percent funded, the level is only 60 percent if the more realistic accounting principles of corporations are used. This would leave New York City with a pension deficit of $49 billion. States must be honest about their pension liabilities and the true value of plan underfunding. They must then take assertive steps to close the gap through a combination of benefit reductions, tax increases, and tapping other sources of non recurring revenues. Issuing bonds to fund pension liabilities, for example, doesn't solve the problem, but it makes it more visible by moving the obligation onto the state's balance sheet, thus encouraging more responsible management. Longer term, states will probably follow in the footsteps of the corporate sector and both freeze their defined benefit plans and shift employees to defined contribution plans. While not as economically advantageous in the long term, the latter are often more popular among workers and are more transparent. Under defined contribution programs, politicians would not have the luxury of granting employees generous pension allowances that state plans are ill-equipped to afford, or to consistently defer contributions. And that would be a relief to taxpayers, once they become aware of the $1 trillion pension bombshell headed their way. Thomas J. Healey is a retired partner of Goldman Sachs & Co., and currently a senior fellow at Harvard University's Kennedy School of Government. He served as assistant secretary of the Treasury under President Reagan. When Michael Travaglini [brother of Senate President Robert] received a $42,000 pay raise in August, upping his annual salary to $322,000, it made for big headlines in The Boston Herald, which alleged that Travaglini, even without the raise, was already receiving a fatter annual paycheck than everyone else in state government. It turns out UMass President Jack Wilson’s base salary of $350,000 is north of Travaglini’s, but that’s beside the point of today’s development and, in the eyes of most taxpayers, merely means that both men make a lot of money. Travaglini had compensation on his mind again and publicly informed state Treasurer Timothy Cahill and the other eight members of the state pension fund board that he plans to weigh their "appetite" and look for a "consensus" about changes in the compensation packages of 22 other employees at the $45 billion pension fund. "There are people I know whose phones have been ringing," said Travaglini, referring to pension fund employees being enticed by more lucrative salaries offered by other pension funds or private sector companies. He mentioned chief investment officer Stanley Mavromates and senior investment officer Wayne Smith by their first names. Describing himself as "frustrated," Travaglini said salaries of some fund employees, compared to their peers, may be artificially low due to "headline risk" and suggested that comparative salary data would be helpful to the board. He recommended comparing salaries to private corporations, large state pension funds, and some endowments. "The problem here from a recruitment and retention perspective is making the total compensation more in line with sort of the industry standard, not so much the public sector per se," Travaglini said after the meeting. Travaglini told the News Service he plans to discuss changes in the fund’s existing bonus program, which permits bonuses of up to 20 percent of an employee’s salary when pension fund investments exceed policy benchmarks, something that occurs only through active fund management. "What I’m going to talk to the board about is revisiting that 20 percent cap, creating more opportunities for incentives if the fund performs and meets or exceeds performance expectations," said Travaglini, who also speculated that UMass President Jack Wilson makes more than him. At the end of the board meeting, Travaglini broached the salary topic, which was not on the board’s agenda, by pointing out that fund staffers had made him aware that the chief investment officer of the South Dakota pension fund had recently received a $216,000 bonus on top of his $293,000 annual salary. He later said he raised the subject in the wake of concerns from two board members about "sensitivity" to the impact of salary increases on pensions – state employees may receive pensions equaling 80 percent of their highest salary over three years, a provision that some would like to rein in. "I literally sprung this on them today and it’s an offshoot from my last salary review," Travaglini said after the meeting. Board member Robert Brousseau raised the idea of hiring an independent consultant to look at compensation, but Travaglini, and Cahill, batted down the idea. "I don’t like independent studies," Travaglini said. Cahill said other boards have used independent consultants primarily to deflect attention away from their own plans to raise salaries. Cahill said he was comfortable, both with not hiring an independent consultant and with Travaglini soliciting input from board members. "I don’t think we need to pay an outside firm," Cahill told the board. "It’s us making the decision as a group." Outgoing board member Peter Schwarzenbach, a Romney appointee, encouraged the board to make sure any changes in compensation structures incorporate incentives based on performance. "You don’t want a bonus to be a slam dunk every year," said Schwarzenbach. "The challenge is to do it right." "We’re comfortable with pay for performance," Travaglini said after the board concluded a meeting where members discussed the likelihood of double-digit returns for the fourth straight year. At another point in the meeting, as the board discussed non-monetary benefits to supplement compensation, Travaglini earned a round of laughter from staffers who lined the conference room when he said, "We prefer the compensation compensation." After serving as senior vice president at Putnam Investments and before that as first deputy under Treasurer Shannon O’Brien, Travaglini was appointed in February 2004 by Cahill as executive director of the state pension fund. The brother of Senate President Robert Travaglini graduated from Harvard University in 1985 and Georgetown University Law Center in 1990. He began his career at the Boston law firm Goodwin, Procter & Hoar.